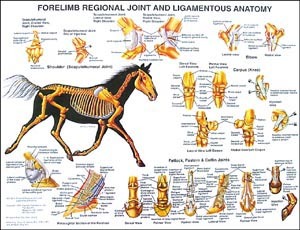 Shows the fore limb & it's corresponding joints. Features full skeleton, highlighting the bones of the shoulder, elbow, carpus & lower leg - emphasis on the fetlock, pastern & coffin joints. 20" x 26" size and laminated on both sides in heavy plastic.